I have sent out a request about an interview to the biggest allys on the russian server. Here is the first answer. Our alliance has been collected from the map, with many players used to play together on different servers, including the World Cup, so the landing was not planned. 2. What are your allys goal for this server? Do you have any opponents? Have you met any skilled players or alliances that you respect for the way they are playing? 3. The russians was superior in the last Final. Do you think you will have better resistance in next Final? Is there any countries that could be a threat? I think that at the third World Cup it will not be any serious resistance to Russian, as they always win! 4.Tell us something about yourself and your account please. Male or female? How old are you? Where are you from? What do you do for your living? How long have you played this game? What do you do when not playing Travian? I am 44 years old, man, I play one, I live in Almaty, Kazakhstan, where I’m running a little biznes. I have played since around 2009. When I’m not playing Travian I spend my time with the children, I have three and a grandson. 5.Anyting else you want to say? Health of all players in the game Travian and their families! Next interview turned out to be a very nice and long one. 1.Your ally is one of greatest on this qualification server. From which country are your members? Have you played the tournament before, alone or as a ally?? Have you preplanned this server? We are all from Russia.We have not played together before this server, except a small part of the server. I did not participate in tournaments in Travian, before that time, and neither some of my friends involved. We did not plan to play on this server. It depended on the situation when it was introduced. 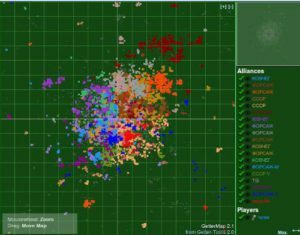 Well it’s not new)) I always played in strong alliances. In fact, I gathered all our alliance and made friends. 3 years of not playing, and then decided to play here, and the people began to gather. Well, in fact, our task is deided, to prepare for the World Cup. So we are doing everything you can train in military operations such as attacking and defensive, in addition of course we are going to build a miracle. And about the enemy, it’s hard to say. We believe that this server is generally quite weak. This is not arrogance, but we did not try hard, and yet we are some of the best on the server, and this suggests a rather low overall level of play. 4. The russians was superior in the last Final. Do you think you will have better resistance in next Final?Is there any countries that could be a threat? I believe that we won in the last final of course affect the willingness of other countries to destroy us as soon as possible. About the threats can not say anything – last final was I was not involved and I did not follow the situation in the qualifying tournaments in other countries. My name is Dmitry. Man. I’m 27. I live in Moscow. I am a businessman and producer. Leading a number of projects in various fields, music, clubs, trade, airsoft, business counseling, etc. So I have quite a varied life. I have played a few years with long breaks. Cool server! Good game. Good company. 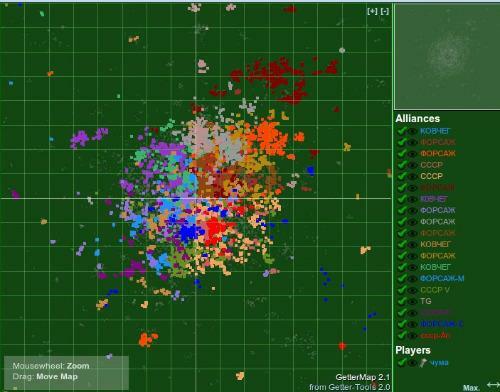 The server have three metas, KOBЧEГ, ФОPСAЖ + TG and СССР (ARK, Forcing + TG and USSR). Forcing have 3 WW hold by the same player. ARK have 2 WW and USSR have 1. Forcing have a very nice strategiskt position with a bridge from their home quad in NE over the Grey zone to their opposite wings which are dividing the ARK meta. The player who holds the USSR WW changed ally from ARK. An agreement about cooperation or an unexspected event? The Grey zone is dominated by Forcing and they hold the most of the border too. ARK is as I mention divided. USSR have managed better on claiming their part of the border and Grey zone. The russian forum is well active. Both in Politics and Reports even if not as much as in the Final when the activity was stunning. On the russian forum the players are allowed to use whatever report tool they want as well as that reports don’t have to be censured. That opens up for a more lively and detailed discussion which can be both serious and teasing. The most cause to moderation is bad language. I miss Zeek, his treads mostly was closed, not because of bad language. For some reason neither players or moderators liked his topics. 1. Your ally is one of greatest on this qualification server. From which country are your members? Have you played the tournament before, alone or as a ally?? Have you preplanned this server? Ваш союзник является одним из величайших на этой квалификационного сервера. Из какой страны являются ваши члены? Вы играли на турнире прежде, один или в качестве союзника? Вы заранее спланировано этом сервере? We are from Russia Ukraine Germany. Yes, I took part in the qualifying tournament for the European Championships, the qualifying tournament for the World Cup and World Championships, respectively. on Ch I played in the alliance UC. No it was not premeditated. Funny thing happened on this server, we was 5 people that joined, a small team just for the fact to get to the World Cup. We made an alliance “for ourselves” and family at the start of the game, and then as suddenly it turned out that we have 60 people and we have a top10 alliance. из России Украины Германии. Да я принимал участие в отборочном турнире на чемпионат Европы, отборочном турнире на чемпионат мира и соответственно на чемпионате мира. на ЧМе играл в составе альянса UC. Нет никакой спланированности не было. Смешно получилось на этот сервер мы пришли в 5 человек, маленькой командой просто для того, что бы пройти на ЧМ. Сделали альянс “для себя” и фанились на старте игры, а потом как то неожиданно получилось, что нас уже 60 человек и мы в 10-тке топовых альянсов. Каково ваше мнение о состоянии сервере? To play on the server is boring. A few strong players, and the players are not so many. Markedly diminished interest in the game. играть на сервере скучновато. сильных игроков мало, да и игроков самих по себе мало. Заметно снижение интереса к игре. что вы уважаете за то, как они играют? ARK coalition allies alliances. Opponents of course there is – the rest of the server Yes, before I have crossed paths with many players. союзники альянсы коалиции КОВЧЕГ. Противники конечно же есть – весь остальной сервер Да, ранее так или иначе пересекались со многими игроками. 4. The russians was superior in the last Final. Do you think you will have better resistance in next Final? Is there any countries that could be a threat? Русские были доминирующими в последнем финале. Как вы думаете, вы будете иметь лучшее сопротивление в следующем Final? Есть ли страны, которые могли бы представлять угрозу? I think the only threat to this ruteam is ruteam. 5.Tell us something about yourself and your account? Male or female? How old are you? Where are you from? What do you do for your living? How long have you played this game? What do you do when not playing Travian? Расскажи нам немного о себе и ваш счет? Мужчина или женщина? Сколько вам лет? Oткуда Bы ? Что вы делаете для вашей гостиной? Как долго вы играли в эту игру? Что вы делаете, когда не играете Травиан? Eugene ’32 from Moscow. I play for more than 5 years. The rest is actually as we all probably, home, work, family. Евгений 32 года из Москвы. Играю более 5 лет. Остальное собственно как у всех наверное дом, работа семья.